Public Enterprise Development State Minister Lakshman Yapa Abeywardana said today he knows his mathematics and he has served as a bank employee for 7 years before coming to politics and therefore, no one must try to teach him maths or figures of trillions or millions. Minister Abeywardana said he still maintains that the Central Bank bond scam has caused a revenue loss of rupees one trillion to Sri Lanka in the next 30 years if remedial measures were not taken. "I don't want to get advise from babes in politics," he stressed. Responding to Daily Mirror at the SLFP weekly news conference yesterday at the party office on comments made by UNP District Parliamentarian Nalin Bandara that the figure quoted by Minister Abeywardana was incorrect and he must correct it. 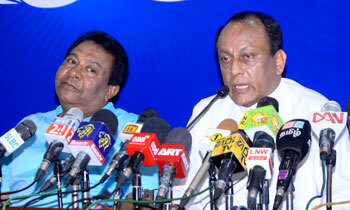 Minister Abeywardana said if no action was taken to mitigate the losses from the illegal bond deal, it may rise to Rs. one trillion in 30 years. “I know what I say. I have been a minister for more than 20 years and have worked as a bank employee before entering politics. Therefore, no one must attempt to teach maths to me. I still say that it would be a colossal loss of revenue to the Treasury running to one trillion rupees in 30 years,” Minister Abeywardana said. Then why could you not calculate the Z score for your buddy next to you? Neither being a bank employee either ! - what matters is your grade in the SSC/GCE for maths , applied maths and whether you had any higher education qualification in maths allied fields or even a plain and simple arts graduate.qualification. - I repeat - being a bank employee - front office or otherwise - is nothing to crow about. Seriously, we are goners if jokers like this continue to do politics. In your maths how much the loss occurred dring the previous regime ?? Zillion or ZZZillion or ZZZZZZillion ? During last general election, how much money did you spend and where did you get it from?